Ah, the joys of travel when the weather gets bad and air traffic control delays kick in. After a perfectly relaxing Cathay Pacific flight, we go to the American Airlines counter to re-check our bag. While I realized there were some weather issues in New York, I didn’t realize so many flights were canceled. While the lines weren’t that long, there were some rather pissed off passengers. There always seems to be that one passenger leading the pack, who, as luck would have it, has no clue what the hell s/he’s talking about. Today it was an older lady that I would guess to be a librarian or “educator.” Apparently she had been stranded at SFO overnight and had to pay for her own hotel. She gathered her “soldiers” (other pissed off passengers) and prepared for battle. Now of course these cancelations and delays by American were legitimate — due to weather and air traffic control delays. They’re totally outside of American’s control, but of course this lady seemed to disagree. First she argued that there was no weather issue, making it seem as if American was delaying flights for fun. Then she requested a refund, and the agent said she couldn’t do it because the delay was due to air traffic control. She then said she wouldn’t leave until she got a refund, saying that they would have to arrest her if they wanted her to leave (little did she know….). Then it got really funny, as she harped on and on about how bad the airline industry has been since deregulation. Something tells me she chose her air carrier based on price as opposed to anything else, so the whole “I’m never flying this airline” argument probably fell on deaf ears with the patient agent. It was rather entertaining to observe her for the better part of 30 minutes. Eventually she threatened litigation. For some reason the agent didn’t look scared. Unfortunately it all went downhill from there. After spending an hour or so in the British Airways lounge at SFO, I checked the flight status, only to see that the redeye my brother and I were on was canceled. We went to visit the very friendly agent we had spoken to earlier (and we were friendly to her, complimenting her on doing a great job and sympathizing with the awful day she must be having), and wanted to see what she could rebook us on. Our cancelation was due to crew, so I’d say we had a legitimate gripe (the cancelation was within American’s control). The best she could do was a flight on Tuesday! Ouch. She spent about an hour looking for routing options, at which point we basically gave up. There was a 3:30PM flight, which was pushed back to 6PM. It was oversold by 27, but about ten minutes before the door was scheduled to close they told us to run the gate as they might have seats for us. 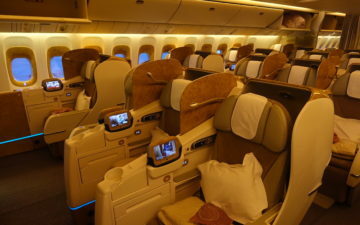 We were accommodated in business class, which is no doubt better than first class on a flight two days later. Still a downgrade, but oh well. We unfortunately had to gate check our bags. I can’t believe I gave in, I just wasn’t thinking. I’ve never gate checked a bag in my life, and I’ve always found space aboard even when they say the bins are aboard. Unfortunately the flight was an adventure as well. The purser started her announcements by saying “we just flew this plane up from Los Angeles under one condition — there is a problem with the reading lights, so we’ll either need to have them all on or all off. We’ll compromise and turn them all on for the first two hours, and then turn them off.” They ended up never turning them off, which made it kind of tough to sleep. We made it to JFK at around 3:30AM. Lovely, right? We go down to the baggage claim belt to collect our gate checked bags. After waiting for about 20 minutes, an announcement is made explaining that we won’t have bags for at least an hour to an hour and a half, due to the strange arrival time of the flight. Lovely planning, American! Now I’m in the Flagship Lounge at JFK waiting to get back home. What a day…. A frequent flyer friend of mine flew Delta from ATL to NYC on Saturday. His quote ‘I’ve had the ride of a lifetime’. Many of us have been there done that, but his tone was something I haven’t seen before. Flew MCO-EWR Saturday (3 hrs late). I was treated to a great light-[ning] show for the second hour and a very bumpy descent. I complimented the pilot on a great landing and he said we were lucky as the winds were quite strong, but right down the runway. Hope you arrive home with at least a small portion of you still destressed, after such a nice vacation. I had big delays (roughly 6 hours) last night JFK->SFO on P.S. – sounds like we passed in the night! @Matt — My partner and I were on your flight last night. It sure was fun landing at SFO at 4 AM. 🙂 Where were you seated? I was flying from PBI to EWR yesterday after spending a beautiful weekend in Boca Raton. I was delayed over 4 hours and then got stuck in the taxi ride into Manhattan. It was my first ever flight on CO, and catering did not load food at EWR due to irregular operations. @Gene ha! I was in 9D. I’m amazed how many people still got meals on last night’s flight. What a mess though, I’m glad they did proactive compensation. We were in 1A and1B on an international award ticket. After waiting almost 7 hours in the First Class lounge, where sadly the best food is potato chips, we were ready for dinner, even though it was 2 AM by the time of the service. The compensation was quite generous. However, I certainly wouldn’t voluntarily spend 7 hours waiting with no showers in the RCC after an international flight for $250, but it definitely eases the pain when multiplied by two people.